Donald Davidson cooper of Newton Swiney died 2nd February 1890 aged 84. Wife Christina Grant died 22nd May 1890 aged 82. 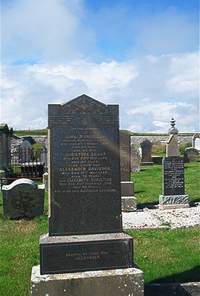 Son Alexander Davidson died 12th May 1928 aged 70. Wife Elizabeth Christian died 25th November 1948 aged 83. Erected by their son Alexander.